Portsmouth, New Hampshire--(April 2010)--Just in time for Earth Day, Hideaways InternationalTM, Inc. (www.Hideaways.com) reveals its list of hotels and resorts that are both gorgeous and green. 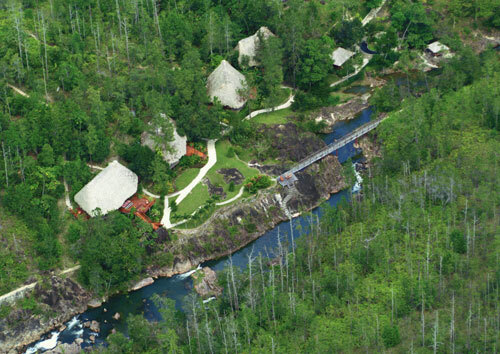 How it's green: Owner Francis Ford Coppola recognized this spot in the Maya Mountains as the ideal place to create a secluded retreat that's also sustainable; the lodge's power is from a hydroelectric plant, and its restaurant sources produce from its organic garden. How it's gorgeous: Welcome to the elegant jungle! Here, each cabana overlooks the pools and waterfalls of Privassion Creek and has a luxe Japanese bath with sky views. How it's green: This all-inclusive resort is green-certified, and everything here is designed to pamper both guests and the environment. Its island-style bungalows, for example, have bamboo furnishings but don't have telephones or televisions. How it's gorgeous: This serene, 135-acre private island has two restaurants and myriad outdoor adventures . . . and guests can indulge without reaching for their wallets--all meals and activities are covered by the all-inclusive price. How it's green: Located in an intact temperate rainforest, this remote yet refined resort recycles, composts, and gardens organically, and its Environmental Legacy Program is a multi-million, five-year commitment to research, conservation, and eco-enhancements. How it's gorgeous: Comprised of a small collection of large canvas tents--guest tents, dining tents, even spa tents--this "eco-safari destination" is utterly unique and truly mesmerizing, especially at night, when each luxe tent glows like an inviting beacon. How it's green: The hotel's "Sustainability without Compromise" approach includes extensive eco-measures (utilizing everything from biodegradable supplies to water-conservative fixtures), as well as offering an "eco-mode" for guest rooms and investing in wind energy to offset 100 percent of the hotel's carbon footprint. How it's gorgeous: Sure, everything Chicago has to offer is just steps away, but guests can easily forget all the hustle and bustle and succumb, instead, to the English manor home sophistication, there-when-you-want-it service, and pleasantly spacious rooms and suites. How it's green: The hotel's "eco-promise" includes creative elements like donating its shredded office paper to local flower growers for packaging material, converting its restaurant cooking oil into bio-diesel, and turning its used glass bottles into road resurfacing material; also, about 90 percent of the food served in the hotel's restaurant is locally grown. How it's gorgeous: Here, guests return to "Old Hawaii," with native-inspired guest rooms that have indigenous materials and patterns, but don't have televisions or radios. How it's green: This luxury bush camp--on 76,000 acres!--is extremely earth-friendly, from their ban on plastic water bottles (they filter their own water instead) to their use of eco-certified cleaning materials and their investment in solar power. How it's gorgeous: The nine safari suites don't have telephones or televisions, but they do have what they call the "key creature comforts" (like comfy beds and plush towels), as well as one feature that's a comfort to creature-loversintimate proximity to scores of wildlife. How it's green: The December 2004 tsunami hit just before the hotel opened, and in response, The Sarojin Khao Lak Community Fund was established and still works to support the community and environment, from building new classrooms to replanting vegetation. How it's gorgeous: Bordering five national parks, idyllic lagoons, and Khao Lak--a nearly seven-mile-long stretch of white-sand beach on the Andaman Sea--guests enjoy a contemporary Asian oasis of restoration, beauty, and legendary service. How it's green: Inspired by Lars-Eric Lindblad--known to many as the father of "eco-tourism"--this line has a fleet of small expedition ships with on-board naturalists who share with guests their great respect for natural and cultural environments, plus on-board chefs who use local and sustainable products whenever possible. How it's gorgeous: Eschewing tourist destinations, the well-appointed vessels are large enough to provide comfortable travel, yet small enough to reach more remote locations. "There's a misconception that 'eco' and 'luxurious' are mutually exclusive vacation options," says Mike Thiel, Founder/President of Hideaways International. "Fortunately, it's very possible to have an experience both you and Mother Nature will really enjoy."